If you ever read Enid Blyton’s The Magic Faraway Tree as a child, you probably entertained ideas of climbing to the top of a tree in your garden and finding a magical place of wonder. What a lovely idea… even if just in the imagination. 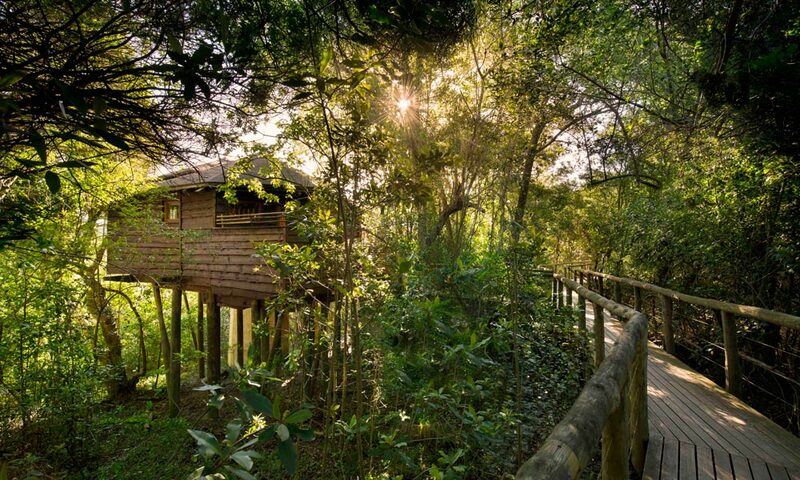 As an adult faced with the daily grind, it can become challenging to find that bit of magic but, at Tsala Treetop Lodge, you might be surprised at what you discover. And, even though you won’t find Silky and Moonface in the foliage, your childhood fantasies will come pretty close to being fulfilled, as you are guaranteed to experience plenty of wonderment at this unique place. 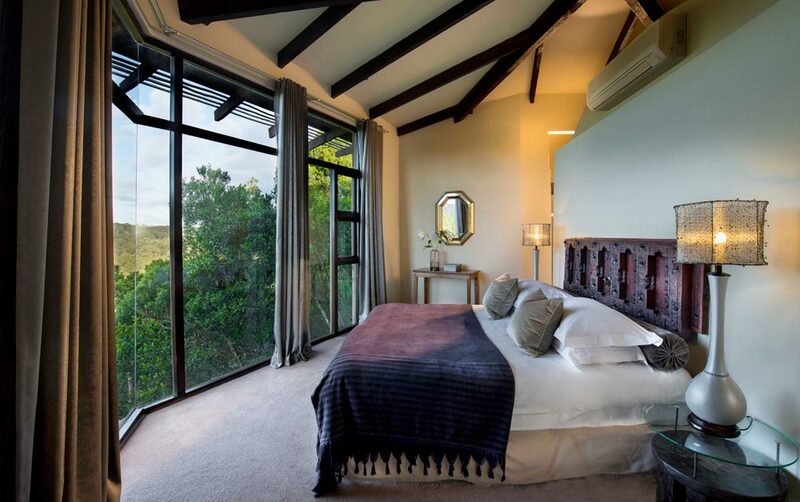 Tsala Treetop Lodge is located just before Plettenberg Bay; the dense forests surrounding it are a signature of the Garden Route and could not be a more perfect location for the lodge. The day we arrived was cold and rainy and yet this didn’t detract from the surroundings at all, if anything it actually enhanced them. Walking down the stone pathway into the receiving area of Tsala Treetop Lodge has a mystical quality to it; giant delicious monsters, fern fronds and beautiful dense greenery line the pathway, lighting almost gives the illusion of fire either side of the path and the pitched thatch roof, above large ornate timber doors, stand as a welcoming entrance. There is something tropically-Amazonian and yet uniquely African about it and it sets the tone for your stay. Upon arrival we were immediately ushered to a cosy lounge area, warmed by roaring fires and given a welcome drink of our choice. There is no formal reception area and any paperwork for your check-in is completed in this area – this ensures that your stay starts in the most relaxed way possible. Once our bags had been collected from the car they were delivered to our room and we were taken by our hostess to our abode for the night. 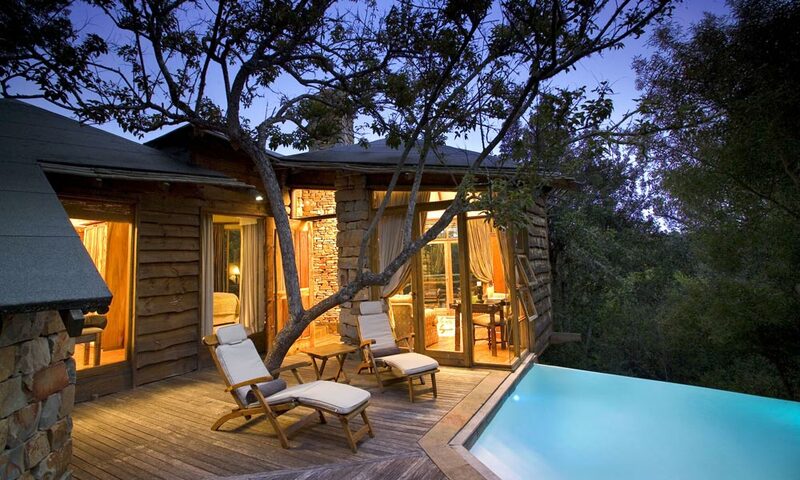 Tsala Treetop Lodge consists of 10 Tsala suites and 6 2-bedroomed villas, which are set along a meandering, elevated wooden walkway. 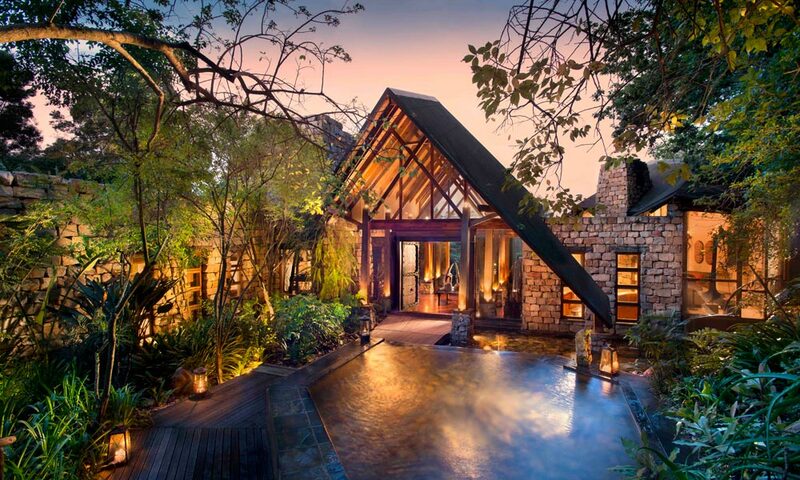 Each truly is its own private oasis and means utter escape and tranquillity for guests. A stunning infinity dipping pool, which seems to drops off into the green abyss below, is the first thing you notice as you go through the gates to your timber suite area. As tempting as it was, the weather was just not warm enough to give it a go but come summer, I’d bet it’s hard to leave it. Our timber suite was luxuriously kitted out and cleverly blended a stylish African feel with every modern amenity you could need. A lounge area, with a deck that overlooks kilometres of dense forest, led onto the bedroom followed by the most gorgeous adjoining bathroom. The bathroom alone makes you not want to leave, complete with large stone tub, indoor and outdoor showers and stunning hand-beaten copper taps that complement the timber elements. After opening a bottle of red wine and enjoying some snacks in the room, we retired to a comfortable couch with books and the intention to completely unwind. 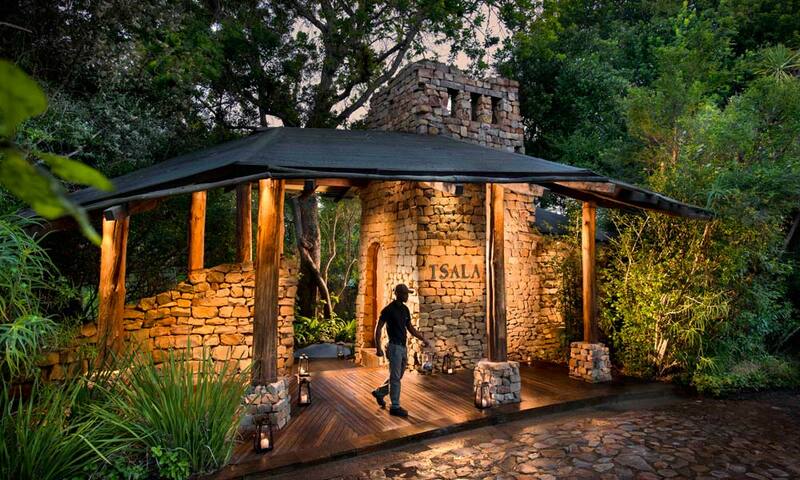 There are a few options for dining at Tsala Treetop Lodge; you can opt to eat in the main dining area of the hotel, at a separate restaurant located on the property called Zinzi Restaurant, or at the fine dining offering at Sage at Hunter’s Country House, another boutique hotel, also located on the property. We were booked in to dine at Sage at Hunter’s and enjoyed an absolutely magical dining experience. 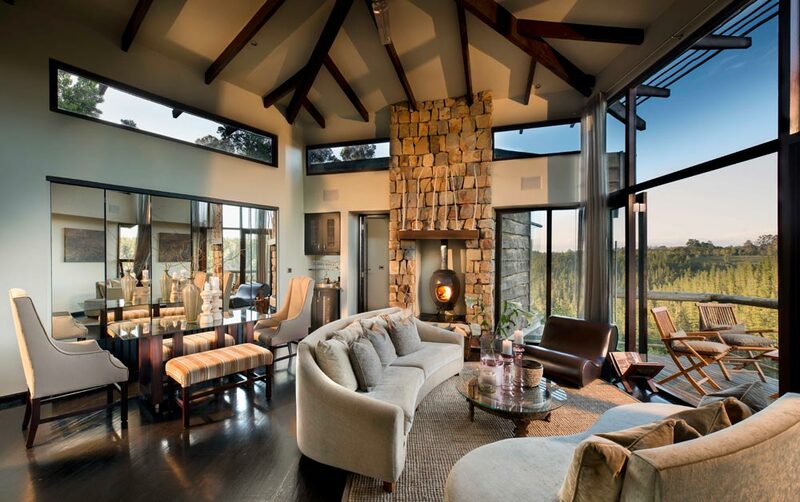 A private dining room set just for two with a roaring fireplace and special touches like menus printed with our names. The team is clearly well-versed in going the extra mile, making it an absolutely superlative place to celebrate a special occasion. We enjoyed a divine three-course meal, of which the most memorable courses were a succulent pork belly main, perfectly cooked salmon and a to-die-for crème brûlée. Thoroughly full, we meandered through the gardens and back to the cosy comfort of our cabin, where the warmth of a roaring fireplace awaited us. The team had been in to do a lovely turn down complete with a millionaires shortbread treat and a bed warmed to toasty perfection by hot water bottles on each side. It was absolute heaven to slip into the fluffy folds and sleep in utter peace in our magical treetop room. After a beautiful breakfast spread of fresh fruits, pastries and a cooked breakfast, we felt we definitely needed to walk off some calories and so took a wander across the property. The grounds are vast and include both lodges and Zinzi restaurant. Wandering the immaculately kept gardens led us to a gorgeous little forest chapel, specifically designed for special occasions such as weddings and christenings and with views over the valley. As we headed back to our room we even spotted the sweetest deer that was the image of Disney’s Bambi, which just sealed our Tsala experience. We regrettably had to make our way back to the real world and check out but GM Karin and the team ensured that we were ready to go, having had our bags packed into our vehicle and sending us off with a snack pack of cookies and water for the road. A delightful and thoughtful parting treat. 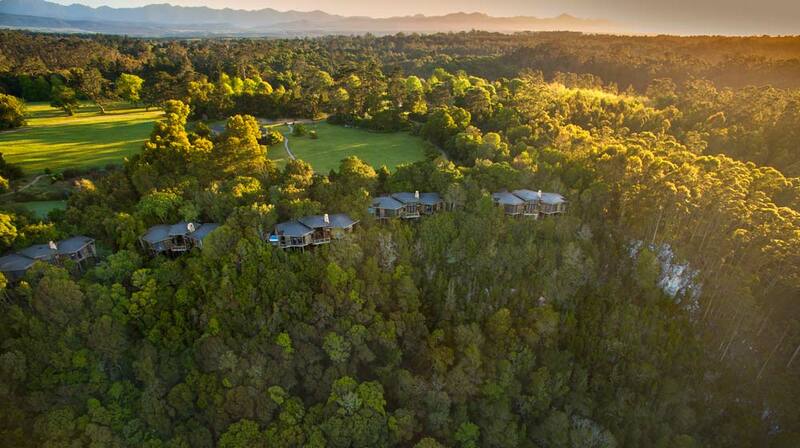 There was complete silence in the car as we left Tsala Treetop Lodge, other than perhaps a little sigh. The experience really is a unique and otherworldly one. Once you are in the warm embrace of the lodge it is easy to switch off your phone, breathe deeply, exhale slowly and completely let go. Something that is incredibly valuable and also very hard to find these days.